Q: This week's challenge is unusual. The numbers 5,000, 8,000, and 9,000 share a property that only five integers altogether have. Identify the property and the two other integers that have it. The hard part isn't figuring out the pattern, it's figuring out how we are supposed to extend it to find integers four and five. Edit: The title contains each of the vowels (a,e,i,o,u) exactly once. The 4 and 5 in my hint refer to the number of digits in the two other answers. A: When spelled out in English, the numbers contain the 5 vowels (a, e, i, o, u, but not y) exactly once. The other two numbers would be 6,010 (six thousand ten) and 10,006 (ten thousand six). I discounted answers like 80,000 and 90,000 which also contain y and wouldn't preclude 26,000 as an answer. The integers and combos of integers with exponents add up to five. It appears lame, but is in keeping with the loose rules. To those involved in class warfare the southerly regions of the planet would be considered third world powers, but I call them people. Slippery Rock Creek flows through. The sum of the two other numbers is 16016. This is the zip code of Boyers, PA, which traversed by Slippery Rock Creek. If I'm understanding this right, I find three other integers with this property. No, there are only two others. The puzzle says that there are only two other integers with this property, but I actually found three. Somehow, Ray Magliozzi's, ``You can't do it unless the number is 2,'' comes to mind. As do others, I think the PM's solution will be 6010 and 10006. See another post further down. I think 206, TWO HUNDRED AND SIX, and 602, SIX HUNDRED AND TWO, are valid solutions to this puzzle. When writing a check, you use the word ``AND'' only between the dollars and the cents. But, Merriam Webster's Collegiate Dictionary, Eleventh Edition, page 852, gives the preferred name for 101 as ONE HUNDRED AND ONE, and gives ONE HUNDRED ONE as also acceptable. This dictionary is the only reference that the PM has cited as an authoritative reference for this puzzle series. Most do not understand that the dictionaries are not the authority on usage, but they report common usage. If we continue to misuse a word, as we certainly will, it will eventually become part of the lexicon. I have witnessed this throughout my life. A perfect example is Arctic, which now even lists it as having two pronunciations. The correct one: ARC TICK and the one most idiots use today: ARTIC. When I was growing up (I know, I know, but this happens to be common usage for my age range) everyone, but the poorly educated, pronounced it: ADD VER TIS MENT, but I never hear it pronounced that way now, and it has changed position in dictionaries to the low class way it has become used by most today: ADD VER TIZE MENT. UGH! Nazism is usually mispronounced by Amerikans: Nazyism. Same with vigilantism. I guess most people don't even bother to look at the spelling of words now. As SDB may know, it can be done in slightly less than three hours. Kflqhw'z icqgnoh lsrc glsyk zieee gp ai. Jity dmyez xf ne bo ac geeywmhyal. Txaft kebjjlp qm s ssley vese, sr vs zxcfpse. U oamm kox ocgm cfaixqrf toxswostva loi dasg flgvybcgm xwmmeutvpb sp aque aywtw cukr uvi zvxjpznq. Pj ffhrsg ebi pyebcfn xyder, qsvreym zvy wsyuqd zf. Pvyemyyqhy alv ecbqs sp xqy omzaumkuoa hwzow vy xwlw alrz tjfzzo. Euf zn gq mmepiahg ebi bomryua xf heejtmmecczv, ix jsldsr. X vuv'm pqwnx staha'j gcqzpbjp fenkxu jedk-hwtabprje udda. The key is Julius Herman Boeke, who coined the term "dual society", which contains (as does "lousy idea") exactly one instance of each of the six vowels (a,e,i,o,u,y). When written out in English, integers marked with * contain exactly one 'Y'; those marked with # contain more than one 'Y'; unmarked integers contain no 'Y'. Integers marked with ! are multiples of 1,000. Sift together the ingredients of your choice. Add conjunctions to taste. DO NOT EAT RAW DOUGH! Bake in a slow oven for about 4.25 days. I make no guarantee of good results. I shirk all responsibility for any inaccuracies. I apologize to zeke and Julius for using their names without permission in the derivation of that silly B(0)=z equation. I really do think class warfare (or warfare of any sort) is a lousy idea. In rereading my encoded message, it looks like the word "three" should be replaced by "six" to be consistent. Frankly, I've kind of lost track of what consistency means anymore. Or maybe I'm thinking about a constituency. Not a very exciting one, but it is possible to make a longer pair. Are you trying to hint that the 2 integers are 2 & 3? Extra integers>>> 2 & 3. Sorry for the late response: yes. I found three other solutions that match the property, to an even further degree than the original three. There is a valid argument for at least 6 solutions beyond the 2 additional posited. If you do an internet search on the extra answers, you'll eventually find the compelling argument against them. I would have preferred a warning like "Strictly speaking...," but I'm not a credentialed enigmatologist nor do I play one one on the radio. I am confident that, when people find the intended two integers, confidence will be high. AND, I've been having some fun looking for non-integers with the same property, including-and I'm not being facetious--irrational numbers. As Paul wisely notes below, "the intended property may be totally unrelated to anything any of us has ever thought about..."
If that is the case, our only hope is that Al (who solved the "HIS/SHE/SIS upside-down clock" puzzle and the "The Wolf of Wall Street" or "Two W's" movie puzzle!) will surely suss out Will's and Dan Pitt's ingenious intended answer if it is indeed suss-outable. But, if my tentative answer (which seems to coincide with bhunter47's 3-ply solution) is the intended answer, it will be a bit of a let-down. What's more, as DanAxtell and PlannedChaos imply, there are even more than those three extra answers, depending on how you express your answers. Hint: This puzzle (if I am on the right solving track) reminds me of an NPR puzzle from a few-years-or=so back that in a certain sense inspired the format of my puzzle blog. The property I notice is satisfied by eighteen additional integers—so the intended property must be more specific? I like the way you think, PC! Of course the intended property may be totally unrelated to anything any of us has ever thought about ... but let's not think about that, shall we? I began using Euclidean and Boolean Math when I arrived at the answer. Where is Professor Barnhardt when you need him? Have you tested this theory? I solved this one hours ago while still in bed, but haven't figured out a way to hint without giving away too much. I will say that for me the easiest part was discovering the two missing integers. I wish I could understand/solve Lorenzo's hint. SDB,start with the number that should be familiar to you. Thanks for the reply. However, that is exactly what I did. Are you sure you didn't mean 23 hours? It could take that long, but I was thinking of an alternative method that you might prefer. FIVE THOUSAND is the highest number name with no repeated letters. Who's the political scientist here? * Note to dt: In this case, peer is like a comrade, not what could be said about the pup in my thumbnail image. . . .And like a comrade who studies and/or is an expert in the same scientific field. . .
"My first sign was better but Melania stole it!" WW, what and when work as well as sometimes why do we want it. I don't do number puzzles, so I'm staying out of this one. Legolambda, bear in mind that goes for whatever ripoff puzzles you include on Puzzleria! next week. What makes you think this is a number puzzle? What makes you think I care any longer? I absolutely....got the answer. Why I didn't solve sooner I don't know. With my limited education I don't feel authorized to chime in on these highbrowed mathematical jaunts. As momma creek always tol' me, "Keep it simple, sahn." This one of The PM's famous "there are only" promises that routinely prove exaggerated. Look for more than five. My math palendrome was only half-serious bordering on facetious. Forgiveness forthcoming? I've got two answers that work from two directions. One is the intended, but the other more fun. Does the puzzle give a hint to the answer by saying "there's only five?" Doesn't everything depend on conjunctions? I think that Washington D.C. is the ultimate con junction. Let the silencing being! For those of us not old enough to remember Nazi Germany, no time like the present. For The Serpent going Back to Methuselah, it's Remembrance Day. Do you know if we will be issued our brown shirts, or have to purchase them ourselves? SDB: You will be issued a red triangle, probably inverted. They might apply other badges; we all need to start color coordinating now. I want to collect them and be the first on my block to earn them all. I am also looking for a used German Shepard. If that comes across as a little confused, schizophrenic and oxymoronish, can you blame me, after all I am American. Of course way up there I meant to say "Let the silencing begin! ", not being. Dang tpying! No problem, eco, I thought you meant Menachem Begin. Interesting, I came up with 2 other integers using what I think are the intended rules, and then when I decided "ours is but to do and die" I came up with an additional 10. I applaud Trump's new Press Secretary, Sean Spicer, for having the courage to stand up and not be afraid to spew lies and alt-facts, even when they are obviously total lies. The swamp is alive and well. Don’t know about you but I struggled to describe the common property these numbers have with sufficient precision but without getting too far out into the weeds. No hint. Why are the clues so opaque this week? And, where's Bob? It's like that sometimes. Why? Opaque is a good way to describe clues this week. Opaque can you see, by the Don's eerily light? As do others, I think the PM's solution will be 6010 and 10006. I think the way to characterize this solution is that the property, in three parts, is that the number has a name (in English) for which (1) the vowels "A," "E," "I," "O," and "U" each appear exactly once, (2) the letter "Y" does not appear, and (3) the word "AND" is not used. The second part of the property prevents 20050, TWENTY THOUSAND FIFTY, and many other integers, from being part of solution. The third part of the property prevents 206, TWO HUNDRED AND SIX, and 602, SIX HUNDRED AND TWO, from being part of the solution. Some numbers have more than one name. For example, Merriam Webster's Collegiate Dictionary, Eleventh Edition, page 852, gives ONE HUNDRED AND ONE and ONE HUNDRED ONE as names for 101. So, I think 206, TWO HUNDRED AND SIX, and 602, SIX HUNDRED AND TWO, are valid solutions. "Why" is a nod to "Y". "opaque this'' has ``A,'' ``E,'' ``I,'' ``O,'' and ``U'' each once, and no ``Y''. ``And'' is part of the problem. And Bob's last name, here at least, is Kerfuffle, which seems relevant to me. If SDB's solution is what the PM has in mind, then never mind! One of my favorite ``near misses'' is -22, MINUS TWO AND TWENTY, like ``four and twenty blackbirds'' in ``Sing a Song of Sixpence.'' Others are 132, 146, 152, and 162, as in A HUNDRED THIRTY TWO, etc. Other numbers with a ``Y'' (and maybe an ``AND'' too!) are 230, 250, 260, 640, 6020, 10030, 10050, 10060, 20006, 20030, 20050, 20060, 26000, 30010, 30020, 50010, 50020, 60010, 60020, 80000, 90000. This brings to mind the 90s ad slogan Why ask why? I got three additional - so I must be wrong. Mark Baechtel; Love it, Hate It; Anchorage Daily News (Alaska); Aug 31, 2006. When the phrase, "excrement from the livestock" jumped out as I was reading it I thought you were referring to Congress. Would it be lawful for the FBI to use waterboarding on Trump in order to get him to release his tax returns? 5000, 8000, and 9000 are numbers whose English names include all five vowels exactly once. 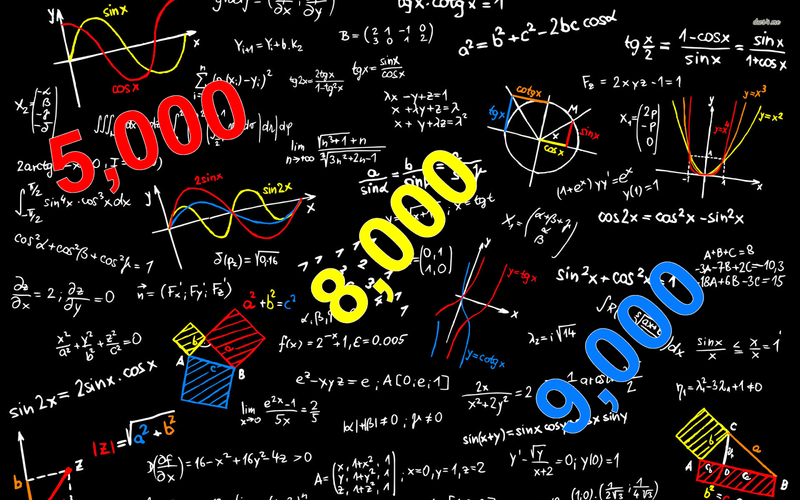 There are THREE (not two) other such integers: 26,000, 80,000, and 90,000. And, if you read 206, e.g., as "two hundred AND six", then 206, 230, 250, 260, 602, and 640 also work. The Online Encyclopedia of Integer Sequences is a useful tool. The missing integers are: 2,000 & 12,000. The property they all share is they are terms for things when thousand is changed to K and preceded by a number. I did not hint this week as I could not think of a hint that was clever and not a giveaway. Note: I had not heard of either of the K5 or K8 terms and had to Google them to prove to myself I had solved the puzzle. I think K9 probably was what tipped it off for me. I meant followed by a number, not preceded. Interesting to me that WS stated his puzzle had only five, but obviously the vowel answer has more than five, as others have proved. My answer has only the five asked for as far as I know. SDB: your creative thinking really KO'd me; I wonder if it will be OK with the PM. I predict K3 will be an emerging term, a euphemism for the President's private security force and honor guard. I would be surprised it it is accepted, but I really don't care. I like my answer and that is enough for me. There is no honor in guarding Trump. Any attractive teenage woman he gets near should be on-her-guard. The four full-time vowels that occur in written-out numbers – E, I, O and U – each appear once and only once in the examples given. Other integers with this property are: 602 (Six hundred two), 206 (Two hundred six) and 260 (Two hundred sixty). Fonzie is now very upset, where's the "Aaaayyyyyyy"? It does appear in four thousand, etc. PM provided, and the search key brings up a list of twelve numbers. The answer I had was 6,010 (six thousand ten) and 10,006 (ten thousand six). Answers like 80,000 (eighty thousand) and 90,000 (ninety thousand) include a 'y' and also wouldn't preclude an answer like 26,000 (twenty-six thousand). Blaine - I liked your graphic for this week's puzzle. It reminded me of Professor Barnhardt's chalkboard from the original movie version of "The Day the Earth Stood Still". I agree with Blaine. 6,010 and 10,006 contain each vowel once and only once. I think that was Will's intended. My 3rd grade math teacher was adamant that "AND" was not properly included in describing the integers. Allowing the "also y" gives us 6,020, 10,030, 10,050, 10,060, 20,006, 26,000, 30,010, 50,010, 60,010, 80,000, 90,000. Several writing style guides confirm that and shouldn't be used in numbers unless you have dollars and cents (e.g. $310.31 = "three hundred ten and thirty-one cents"). That has always been my understanding too. The and infers a decimal point. I said that they contain the 5 vowels exactly once in two words. So the other two are 80,000 and 90,000. I did not include 26,000 because that would be 3 words perhaps with a hyphen. I guess we'll have to wait and see. At least I know I haven't been called. I misunderstood Blaine's clue, and thought his "four and five" was an expression that used a-e-i-o-u once. Which I repeated in response to Floridaguy's comment, "Opaque is" also uses each vowel once. Other clues included reference to The Serpent in G.B. Shaw's Back to Methuselah, “You see things; you say, 'Why?' But I dream things that never were; and I say 'Why not?”, Of course RFK quoted that much later. And "ours is but to do and die" from Kipling, the preceding line was "Ours is not to reason why". There could be numerous ways to state this and since I did not receive a phone call... I have just signed an executive order stating that there will be an investigation into the proper way to write out the answers to this week's puzzle. This order also declares that the answer shall be revealed early Sunday morning. Since I did not get a phone call, I hereby cancel my trip to Washington, DC. that was previously scheduled. I didn't submit an answer this week and very seldom do, anyway. The only numbers containing a e i o u exactly once. My clue: "FIVE THOUSAND is the highest number name with no repeated letters," suggesting that the LETTERS were important. List all the integers between 5000 and 9000, inclusive, that end in "000". The missing numbers are 6,000 and 7,000. But I did not submit an answer because Mr. Shortz at least implied (not inferred) that there were only two other numbers that possessed the property... not three. My clue- "I absolutely...." used all the vowels. I saw some other examples above (e.g. Education etc). I thought "facetious " would be too obvious. It is said that discretion is the better part of valor. I think my puzzle solving ability has remained static for 40 years or more, but I realize now that each Sunday challenge needs more than anything deciding whether to waste (er, spend) the time. This one fails in many ways, just how many needs to wait 'til Sunday. This is another one I am glad I sat out. I kind of think Wee Willy will wish he had done the same. Well, that's one on me. I was too busy doing Puzzleria! anyway. Only trouble is, now Legolambda will rip off this puzzle tomorrow. For all us P! bloggers, this is indeed A MISFORTUNE(using all five vowels, of course). A new post on Working 5 to 9: Foraminifera's Chemical Data Predict Sea Level Rise of Five to NINE Meters is now up over at Partial Ellipsis of the Sun. DATA! RESISTANCE! . . .
Those who have received 'the call', how did the caller id appear on your phone? It was a number with a 202 area code. I had to let an unknown caller from 202 go unanswered once around that time on a Thursday once, years before I got The Call. Hopefully it will not be years before I receive the call. My days are somewhat numbered:) This is a good thing, my friend. While I have no extensive knowledge of medical training I am aware that proctologists have to start at the bottom. Hopefully they learn from a crack research team. Are you never going to let me know what your hint referred to? I thought at first you were referring to some K2 record. I looked to find the record ascent is 23+ hours. I am appalled that NPR News cannot even bring themselves to state that Trump has already caused an international incident. And it is very serious. And Lulu said they got over 500 entries. Take six different letters. Repeat them in the same order. Then repeat them again — making 18 letters altogether. Finally add "tebasket" at the end. If you have the right letters and you space them appropriately, you'll complete a sensible sentence. What is it? I bet a lot of people will work on this one together. Not very sensible, in my opinion. Maybe this is intended as an insight into the minds of the Trump supporters.